It's still fall right? I have to keep reminding myself that because as soon as Halloween is over it might as well be holiday time. Since, it's still technically fall I have a great KBShimmer fall polish to share with you today. Teal Another Tail is a dusty teal with a pink duochrome shimmer. Color: I love this color. This shade of dusty teal is unique for fall and the duochrome shimmer really makes this special. I'm not typically a fan of duochrome in flat metallic polishes, but with a shimmer I am completely sold. I love this effect on a shimmer! The duochrome flashes from pink-gold-bronze depending on light. Formula: Nice formula on this, though it is sheer on the first coat. I recommend using 3 coats. 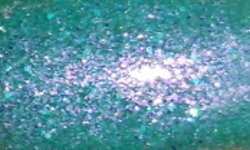 Price: $8.75 on KBShimmer's site. Overall: I consider this a must have polish. Teal Another Tail is a beautiful color with a unique finish. KBShimmer always surprises me something I could of never thought of with nail polish in each collection. This one is a winner, stunner, and all around awesome polish! Sweater Weather Tag- I Tag You! Help! Who are your fave handmade indie brands?